1. 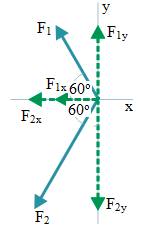 A force of 20 Newton makes an angle of 30o with the x-axis. Find both the x and y component of the force. 2. F1 = 20 Newton makes an angle of 30o with the y axis and F2 = 30 Newton makes an angle of 60o with the -x axis. 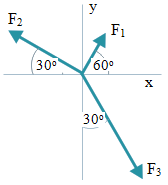 Find both the x and y components of F1 and F2. 3. F1 = 2 N, F2 = 4 N, F3 = 6 N. Find both the x and y components of F1, F2 and F3!